The vast gap between America's haves and have-nots is hardly news, but the recent recession and soaring unemployment have cast the monetary chasm into sharp relief. With Wall Street digesting the $90 billion in bonuses that it paid itself in 2010 while millions of families struggle to put food on the table, it has become increasingly clear that there are two Americas: the top 40%, with an estimated 95% of the country's wealth, and the bottom 60% which survives on just over 5%. And with the extension of the Bush-era tax cuts for the rich, this division seems likely to grow. Two weeks ago, I compared the amazing salaries of America's best-paid citizens to the much smaller amount that the median American household earns every year: a modest $49,777. That's a number that we can easily wrap our minds around -- it's human in scale. By contrast, Larry Ellison's 2008 paycheck of $543 million can be almost impossible to comprehend, so understanding that his earnings that year equaled the income of almost 11,000 families helps put the Oracle chief's impressive fortune into perspective. With that in mind, this week's piece will look at the toys of the rich and famous -- and how many households they could support. The median household income of $49,777 can seem surprisingly low when measured on an automotive scale. After all, many common cars far exceed that price: The Cadillac Escalade, for example, starts at $63,160 -- 26% more than the average household makes in a year -- and goes up to $84,790. For that matter, a BMW 7-series starts at $70,153, and rises to $137,000, roughly the same as the household income of 2¾ American families. And the Chevrolet Corvette, America's favorite midlife-crisis-mobile, starts at $48,950, or 98% of the average household's yearly paycheck -- and that's without a convertible top! For decades, the Porsche 911 has been among America's favorite aspirational cars: Starting at $77,800, the speedy little German car goes up to $143,800, or almost three times the average yearly household income. While the 911 is out of the price range of most American families, a few lucky people have both the means and the desire to stockpile the cars. Jerry Seinfeld, for example, has an estimated 47 Porsches. It's hard to gauge the value of the comedian's collection: Were these all low-end late-model 911s, the grand total would be $3,656,600, or more than the yearly income of 73 households. However, Seinfeld's collection is actually worth much more: among its dozens of higher-end cars, the centerpiece is a rare Porsche 959, valued at $700,000 -- or the yearly incomes of 14 households. Unfortunately, because of legal restrictions, the pricey sports car can't be driven on American streets. One can't park a collection like that on the street. Seinfeld's cars occupy a two-story space on New York's Upper West Side, near his home. After buying the building for $880,000 in 1999, Seinfeld spent $500,000 renovating it. The ultimate cost equaled the yearly income of 27 families. Yet Seinfeld's car collection pales next to that of Jay Leno. The Tonight Show host owns an estimated 100 cars, ranging from a 1906 Stanley Steemer to a 2006 Corvette. While the total value of his collection is almost impossible to gauge, one of his cars -- a Mercedes SLR McLaren -- carries a price tag of $450,000, or slightly more than the yearly salary of 9 families. The Leno collection is housed in a 17,000 square foot garage, where his staff -- including a master mechanic, an automotive engineer and a "body man" -- all report to work. Regardless of the exact value of Jay Leno's car collection, it pales in comparison to some of the top prizes on the ocean. 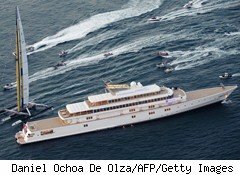 For example, the Rising Sun (pictured above), a yacht once owned by Oracle CEO Larry Ellison and now possessed by David Geffen, is valued at $200 million. The boat, which Ellison got rid of because he was unable to dock it in most marinas and found its cavernous interior cold and uninviting, equals in value the household income of over 4,017 families, the population of a small city. Ellison's toy was originally designed to dwarf the Octopus, a yacht owned by Microsoft honcho Paul Allen. While Allen's 414-foot boat is 40 feet smaller than the Rising Sun, it is still quite impressive. Among other things, the Octopus has two helicopters, a pool, a 12-man submersible, a basketball court, a movie theater, and a recording studio. And, like the Rising Sun, it had a price tag of roughly $200 million. For that matter, the two boats have similar support costs of roughly $2 million per month. In other words, Allen and Geffen both pay the equivalent of 40 annual household incomes each month just to keep their boats in the water. Ellison, meanwhile, is currently awaiting the arrival of a new yacht, a relatively small 40-meter long boat that he will be able to dock in a standard marina. The real focus of his nautical interests, though, lies in a new, even more pricey direction. Last year, the software mogul financed the yachting team that recaptured the America's Cup. At a cost of only $400 million -- or roughly the yearly income of 8,035 families -- he wrested control of the storied trophy from a Swiss team. Compared to a 454-foot luxury yacht, a private jet seems almost prosaic, and the prices of small jets are surprisingly low. For example, a mid-range Gulfstream jet costs $39 million, or the yearly salary of a mere 783 families. For that price, the owner gets room for 12 to 18 passengers, a maximum range of 4,350 nautical miles, and a top speed of 585 miles per hour. Then again, even a lower-level jet can make a very romantic present. When rumors surfaced that Tom Cruise had given Katie Holmes her own jet as a wedding gift, gossip columnists swooned. A $20 million Gulfstream, the Cruise-Holmes airship equated out to 401 households, roughly the population of a small town. For real money men, however, little Gulfstreams just don't convey a suitably impressive level of wealth. Luckily, Boeing and Airbus both offer personal versions of some of their larger aircraft. A private-use Boeing 747-8, for example, costs roughly $280 million -- or the income of 5,625 households. Then again, at that price, the new owners would have to completely outfit the plane, a project that would likely run a further $20 million. And, for people who really want to push the limits, the Airbus A-380, which is scheduled to be released in 2015 or so, will cost roughly $300 million, or the salary of over 6,026 households. While expensive, the plane definitely delivers: Its proud owner could fly dozens of his or her best friends an estimated 9,000 miles between refuelings, making it possible to begin the party in Chicago and finish it up in Sydney, Australia. As tabloid readers become accustomed to hearing about Tom Cruise's personal jet and Jay Leno's car collection, the jaw-dropping prices of these toys become an abstraction, no longer able to pack a punch. Then again, viewed on a more human scale, even the relatively modest $285,000 (5.75 families) that Paris Hilton paid for her diamond-encrusted Bentley GT convertible starts to seem like real money.